When you Google “Facebook friend value,” the results are as myriad as searching for Obama. From .37, to $1, to more than $100. But really, what is the price of friendship, it’s true value— and what about it’s cost? Clearly, we are still grappling with defining the intrinsic value of social media—trying to make a tangible assessment, a dry measurement, but it still eludes us. It’s “like trying to put spilled Jell-O back into a bowl with your bare hands,” as my dear friend Joe Teague used to say. The range of responses to the Facebook question embodies this challenge somehow, but I believe this conversation still misses the mark. I loved what media guru (social and otherwise) Erik Qualman sought to qualify rather than quantify the role of social media in his live presentation to the Dallas Social Media Club last week. (#smcdallas) This is an interesting foil to his previous messaging. You’ve probably seen his seminal, statistics-sprinkled videos about social media. 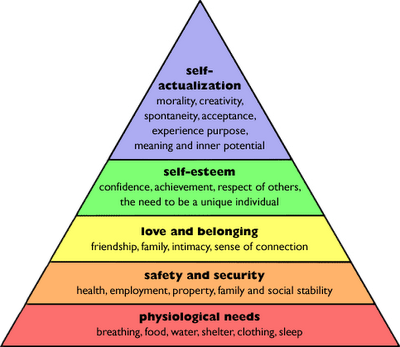 In socio-psychological terms, he posits that social media falls very near the base of Maslow’s famed “Hierarchy of Needs”—just above safety and security. According to Qualman, social media behavior fulfills our basic need for a sense of belonging and connection. Isn’t that priceless? 1. Over 50% of the world’s population is under 30. 2. 96% of them have joined a social network. 3. Facebook now tops Google for weekly traffic in the U.S.
4. Facebook added over 200 million users in less than a year. 5.	iPhone applications hit 1 billion in 9 months. instead they are distributing: eReaders and iPads. compared to those who are not fans. •	Fans are 28 percent more likely than non-fans to continue using a specific brand. •	Fans are 41 percent more likely than non-fans to recommend a product they are a fan of to their friends. You might be saying, “Hey, those companies are all retail, consumer-facing. What about B2B?” And you would be very astute. That’s true. It’s a little easier to connect revenue to engagement around sales of cell phones, underwear, tennis shoes, and food. But, the formula holds for other scenarios. My own experience with the REO Expo is a case in point. We managed to reach and even surpass our attendance goal of 1,500 earlier this month through a strategic, integrated cultivation of our target business audience, using Facebook, LinkedIn, Twitter, focused professional communities, and email marketing promotions. To paraphrase Erik Qualman, change is the only thing that’s certain about today’s social media landscape. So, refresh, regroup, and eat your Wheaties. In the meantime, how would you calculate the value of a friend? Next Post Is social media the new job one? Great stuff Elaine! I really enjoyed my visit to Dallas. I have to give credit to my friend Scott Galloway (NYU Prof and founder of L2) for pointing out the connection of social media and Maslow’s pyramid. Erik, thanks for chiming in. I have shared your video so many times. Great post! Thanks for taking the time to summarize what Eric brought to the group as well as pose the question. With marketing becoming more scientific over the last decade we want to know the ROI, what each relationship is worth, etc. Maybe I’m simple-minded but I still believe the single most important metric is the net promoter score. If you’ll recommend me to those you know…you’re a fan. Given that framework, the goal is to build the relationship (online and offline) until you will recommend me to others. That’s the softer side that’s harder to quantify along the way. Look forward to reading more and appreciate the knowledge you share. Thanks for your comment! I so agree with you that is is really all about relationships–on and off the grid. And now, with the breakneck speed of new media change and associated behaviors, the process of cultivating those relationships is becoming increasingly complex.